Pocket Neighborhood living is intimate and connected. Pedestrian-friendly walkways wind around grassy, green knolls inviting neighbors and friends to interact on a daily basis. There are a variety of different options for living in Inglenook’s close-knit community – quiet tree-lined homesites, corner lots with wrap-around porches, and homesites nestled along the heart of the community greens. Homesite #10 – This homesite is quietly tucked away along the outside of the neighborhood in a beautiful, large, corner lot. Located in the Northeast corner of the Pocket Neighborhood homesite #10 is one of the most private homesites in the neighborhood, and will be among the first set of homes to be completed. This homesite can accommodate a Plumrose, Madison, Ellis, or Iris design. Homesite #2 – With a large wrapping lot, this homesite offers the unique opportunity for a wraparound porch on one of Inglenook’s newest Ross Chapin design – the Spruce. Located near the front of Inglenook’s pocket neighborhood, this home will serve as a warm welcome into the community. Homesites #4 & #7 - Overlooking a common greens, homesites #4 and #7 have the best of both worlds – a quiet outside lot and the action of living on a community green space. These homesites can accommodate a Plumrose, Madison, Ellis, or Iris cottage home design. Interested in finding your perfect spot? 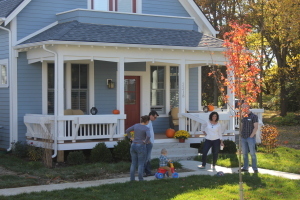 Join us for a private neighborhood tour! For more information please contact us at 317-767-9760 or at info@landdevelopbuild.com. We have just posted our updated and new Zionsville home designs on our website! In the line-up for Zionsville are three returning favorites and two new ones – the Plumrose, the Madison, the Ellis, the Hunter, and the Spruce. For those of you who have toured the Plumrose, Madison, and Ellis at the Inglenook of Carmel pocket neighborhood, we’ve made a few changes we’re excited to share. The Plumrose: A fan favorite at Inglenook of Carmel, the Plumrose is a three- or four- bedroom, two-and-a-half bath cottage-style home with beautiful vaulted bedroom ceilings, numerous large windows, and flexible design. The flexibility in design is a unique attribute of the Plumrose. Take the second “bedroom” upstairs – make it a spacious, quiet master retreat and master bath, or a bright and cheery child’s bedroom and playroom, or a guest bedroom and office. The possibilities are endless and the decision is yours. Updates to the original Plumrose include the addition of a larger laundry/mudroom and a separate office area on the first floor, added height to the bathroom on the second floor, and the addition of a coat closet and pantry. The Madison: The largest of the Inglenook cottage homes, the Madison is a three-bedroom, two-and-a-half bath cottage-style home. We have been working away to bring some exciting updates to the Madison! Updates include: a larger master bedroom on the main floor complete with walk-in closet and larger bath, the addition of a pantry and a coat closet, and most excitingly an option for a wrap-around porch with access to the side-yard! The Ellis: We have blended two of our favorite cottage homes – the Ellis and Iris – to create a one-of-a-kind place to call home. The new three-bedroom Ellis now boasts a main floor master suite with walk-in closet and larger bath and a reconfigured laundry/mudroom area. The Ellis also possesses several different options for your outdoor space – an expansive, room-sized front porch, or a cozy half-porch, a bedroom terrace or outdoor side porch. We are nearing an official announcement to roll out the final neighborhood plan and begin accepting reservations. Single-story, two-bedroom homes will be available upon request. Please remember, certain homes fit on specific home sites. Options are subject to availability. For sales questions please contact sales@inglenookcarmel.com or call us at 317.767.9760. Keep an eye out for more details on the Spruce and Hunter homes later this week! We often have people come from out-of-state and even out-of-country to live in our pocket neighborhoods. For you out-of-towners here are a few things you should know about the town of Zionsville, home of Inglenook’s future pocket neighborhood. Zionsville Smarts – Zionsville’s community schools have ranked in the Top 5 Indiana School Districts for the past 15 years! For more information on which Zionsville schools fall into Inglenook’s district email us at info@landdevelopbuild.com . The Village – Zionsville’s Main Street boasts a collection of locally owned shops, beautiful galleries, and delicious restaurants to explore. Inglenook’s Zionsville pocket neighborhood is a quick walk away! Something to do – The community is known for great cultural activities year round. Look no further than this summer’s annual Lincoln Park and Lions Park free music concert series or Christmas in the Village. Park Land – With over 420 acres of parkland there’s something for everyone to explore, climb, and walk. Zionsville is a wonderful place to explore, love, and live. Hope you’ll join us in putting down some roots! For more information on Inglenook’s upcoming Zionsville pocket neighborhood please email us at info@landdevelopbuild.com. Our sales office is open at Inglenook of Carmel every Sunday from 1-4PM. To schedule a tour email or call us at 317.767.9760.